Things with Bennett are going much better these days. It's been more than 10 weeks since Bennett's most recent surgery and difficult back-to-back hospitalization. 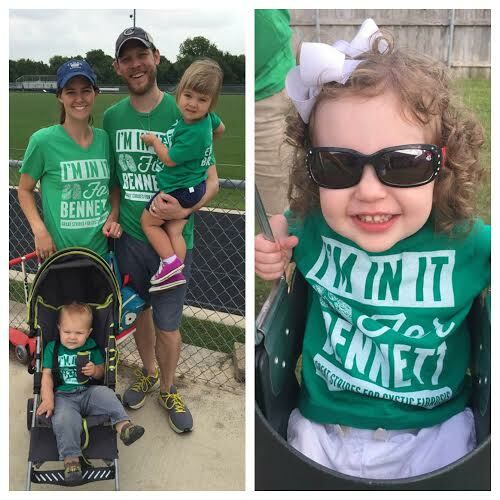 Although we are trying to help Bennett gain the weight he lost through that experience and even though Bennett is still needing pelvic therapy to address his GI issues, he seems relatively back to normal. Thankfully things have calmed down for our family, just in time for things to gear up for Bennett's Brigade 2016! To kick off this year's CF Foundation Great Strides season, here's our newest Bennett's Brigade video. Nothing is more evident of how loved Bennett is than when I see a list of 7 different Bennett's Brigade teams, led by dear friends in 4 different states, who will walk in honor of Bennett this Spring, just exactly as they did last year. All funds donated go to the CF Foundation in honor of Bennett. Want a Bennett's Brigade t-shirt to show your support? T-shirts are $15 and come in child to adult sizes! T-shirts must be ordered by noon CST on April 15th so if you want one in 2016, now is the time to do it!